The data usually needs to be backed up while the applications that produce the data are still running. This means that some of the data files might be open or they might be in an inconsistent state. If the data set is large, it can be difficult to back up all of it at one time. Correctly performing backup and restore operations requires close coordination between the backup applications, the line-of-business applications that are being backed up, and the storage management hardware and software. The Volume Shadow Copy Service (VSS), which was introduced in Windows Server® 2003, facilitates the conversation between these components to allow them to work better together. When all the components support VSS, you can use them to back up your application data without taking the applications offline. You want to back up application data and system state information, including archiving data to another hard disk drive, to tape, or to other removable media. You are performing disk-to-disk backups. You need a fast recovery from data loss by restoring data to the original LUN or to an entirely new LUN that replaces an original LUN that failed. VSS service Part of the Windows operating system that ensures the other components can communicate with each other properly and work together. VSS requester The software that requests the actual creation of shadow copies (or other high-level operations like importing or deleting them). Typically, this is the backup application. The Windows Server Backup utility and the System Center Data Protection Manager application are VSS requesters. Non-Microsoft® VSS requesters include nearly all backup software that runs on Windows. VSS writer The component that guarantees we have a consistent data set to back up. This is typically provided as part of a line-of-business application, such as SQL Server® or Exchange Server. VSS writers for various Windows components, such as the registry, are included with the Windows operating system. Non-Microsoft VSS writers are included with many applications for Windows that need to guarantee data consistency during back up. VSS provider The component that creates and maintains the shadow copies. This can occur in the software or in the hardware. The Windows operating system includes a VSS provider that uses copy-on-write. If you use a storage area network (SAN), it is important that you install the VSS hardware provider for the SAN, if one is provided. A hardware provider offloads the task of creating and maintaining a shadow copy from the host operating system. The following diagram illustrates how the VSS service coordinates with requesters, writers, and providers to create a shadow copy of a volume. This section puts the various roles of the requester, writer, and provider into context by listing the steps that need to be taken to create a shadow copy. The following diagram shows how the Volume Shadow Copy Service controls the overall coordination of the requester, writer, and provider. The requester asks the Volume Shadow Copy Service to enumerate the writers, gather the writer metadata, and prepare for shadow copy creation. Each writer creates an XML description of the components and data stores that need to be backed up and provides it to the Volume Shadow Copy Service. The writer also defines a restore method, which is used for all components. The Volume Shadow Copy Service provides the writer's description to the requester, which selects the components that will be backed up. The Volume Shadow Copy Service notifies all the writers to prepare their data for making a shadow copy. The Volume Shadow Copy Service tells the writers to temporarily freeze application write I/O requests (read I/O requests are still possible) for the few seconds that are required to create the shadow copy of the volume or volumes. The application freeze is not allowed to take longer than 60 seconds. The Volume Shadow Copy Service flushes the file system buffers and then freezes the file system, which ensures that the file system metadata is recorded correctly and the data to be shadow-copied is written in a consistent order. The Volume Shadow Copy Service tells the provider to create the shadow copy. The shadow copy creation period lasts no more than 10 seconds, during which all write I/O requests to the file system remain frozen. The Volume Shadow Copy Service releases file system write I/O requests. VSS tells the writers to thaw application write I/O requests. At this point applications are free to resume writing data to the disk that is being shadow-copied. The shadow copy creation can be aborted if the writers are kept in the freeze state for longer than 60 seconds or if the providers take longer than 10 seconds to commit the shadow copy. The requester can retry the process (go back to step 1) or notify the administrator to retry at a later time. If the shadow copy is successfully created, the Volume Shadow Copy Service returns the location information for the shadow copy to the requester. In some cases, the shadow copy can be temporarily made available as a read-write volume so that VSS and one or more applications can alter the contents of the shadow copy before the shadow copy is finished. After VSS and the applications make their alterations, the shadow copy is made read-only. This phase is called Auto-recovery, and it is used to undo any file-system or application transactions on the shadow copy volume that were not completed before the shadow copy was created. Complete copy This method makes a complete copy (called a "full copy" or "clone") of the original volume at a given point in time. This copy is read-only. Copy-on-write This method does not copy the original volume. Instead, it makes a differential copy by copying all changes (completed write I/O requests) that are made to the volume after a given point in time. Redirect-on-write This method does not copy the original volume, and it does not make any changes to the original volume after a given point in time. Instead, it makes a differential copy by redirecting all changes to a different volume. The original volume and the shadow copy volume are a mirrored volume set. The shadow copy volume is separated from the original volume. This breaks the mirror connection. After the mirror connection is broken, the original volume and the shadow copy volume are independent. The original volume continues to accept all changes (write I/O requests), while the shadow copy volume remains an exact read-only copy of the original data at the time of the break. In the copy-on-write method, when a change to the original volume occurs (but before the write I/O request is completed), each block to be modified is read and then written to the volume's shadow copy storage area (also called its "diff area"). The shadow copy storage area can be on the same volume or a different volume. This preserves a copy of the data block on the original volume before the change overwrites it. The copy-on-write method is a quick method for creating a shadow copy, because it copies only data that is changed. The copied blocks in the diff area can be combined with the changed data on the original volume to restore the volume to its state before any of the changes were made. If there are many changes, the copy-on-write method can become expensive. In the redirect-on-write method, whenever the original volume receives a change (write I/O request), the change is not applied to the original volume. Instead, the change is written to another volume's shadow copy storage area. Like the copy-on-write method, the redirect-on-write method is a quick method for creating a shadow copy, because it copies only changes to the data. The copied blocks in the diff area can be combined with the unchanged data on the original volume to create a complete, up-to-date copy of the data. If there are many read I/O requests, the redirect-on-write method can become expensive. There are two types of shadow copy providers: hardware-based providers and software-based providers. There is also a system provider, which is a software provider that is built in to the Windows operating system. Hardware-based shadow copy providers act as an interface between the Volume Shadow Copy Service and the hardware level by working in conjunction with a hardware storage adapter or controller. The work of creating and maintaining the shadow copy is performed by the storage array. Hardware providers always take the shadow copy of an entire LUN, but the Volume Shadow Copy Service only exposes the shadow copy of the volume or volumes that were requested. A hardware-based shadow copy provider makes use of the Volume Shadow Copy Service functionality that defines the point in time, allows data synchronization, manages the shadow copy, and provides a common interface with backup applications. However, the Volume Shadow Copy Service does not specify the underlying mechanism by which the hardware-based provider produces and maintains shadow copies. Software-based shadow copy providers typically intercept and process read and write I/O requests in a software layer between the file system and the volume manager software. These providers are implemented as a user-mode DLL component and at least one kernel-mode device driver, typically a storage filter driver. Unlike hardware-based providers, software-based providers create shadow copies at the software level, not the hardware level. 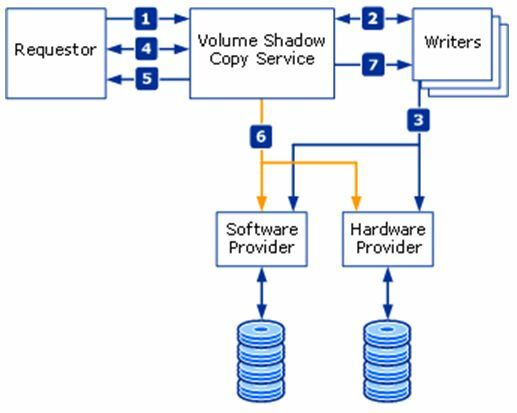 A software-based shadow copy provider must maintain a "point-in-time" view of a volume by having access to a data set that can be used to re-create volume status before the shadow copy creation time. An example is the copy-on-write technique of the system provider. However, the Volume Shadow Copy Service places no restrictions on what technique the software-based providers use to create and maintain shadow copies. A software provider is applicable to a wider range of storage platforms than a hardware-based provider, and it should work with basic disks or logical volumes equally well. (A logical volume is a volume that is created by combining free space from two or more disks.) In contrast to hardware shadow copies, software providers consume operating system resources to maintain the shadow copy. For more information about basic disks, see What Are Basic Disks and Volumes? (http://go.microsoft.com/fwlink/?LinkId=180894) on TechNet. One shadow copy provider, the system provider, is supplied in the Windows operating system. Although a default provider is supplied in Windows, other vendors are free to supply implementations that are optimized for their storage hardware and software applications. To maintain the "point-in-time" view of a volume that is contained in a shadow copy, the system provider uses a copy-on-write technique. Copies of the blocks on volume that have been modified since the beginning of the shadow copy creation are stored in a shadow copy storage area. The system provider can expose the production volume, which can be written to and read from normally. When the shadow copy is needed, it logically applies the differences to data on the production volume to expose the complete shadow copy. For the system provider, the shadow copy storage area must be on an NTFS volume. The volume to be shadow copied does not need to be an NTFS volume, but at least one volume mounted on the system must be an NTFS volume. The component files that make up the system provider are swprv.dll and volsnap.sys. The Windows operating system includes a set of VSS writers that are responsible for enumerating the data that is required by various Windows features. In Windows Server 2008 R2 and Windows 7, VSS requesters can use a hardware shadow copy provider feature called LUN resynchronization (or "LUN resync"). This is a fast-recovery scheme that allows an application administrator to restore data from a shadow copy to the original LUN or to a new LUN. The shadow copy can be a full clone or a differential shadow copy. In either case, at the end of the resync operation, the destination LUN will have the same contents as the shadow copy LUN. During the resync operation, the array performs a block-level copy from the shadow copy to the destination LUN. The shadow copy must be a transportable hardware shadow copy. Most arrays allow production I/O operations to resume shortly after the resync operation begins. While the resync operation is in progress, read requests are redirected to the shadow copy LUN, and write requests to the destination LUN. This allows arrays to recover very large data sets and resume normal operations in several seconds. In LUN resynchronization, the shadow copy is not altered, so it can be used several times. In LUN swapping, the shadow copy can be used only once for a recovery. For the most safety-conscious administrators, this is important. When LUN resynchronization is used, the requester can retry the entire restore operation if something goes wrong the first time. At the end of a LUN swap, the shadow copy LUN is used for production I/O requests. 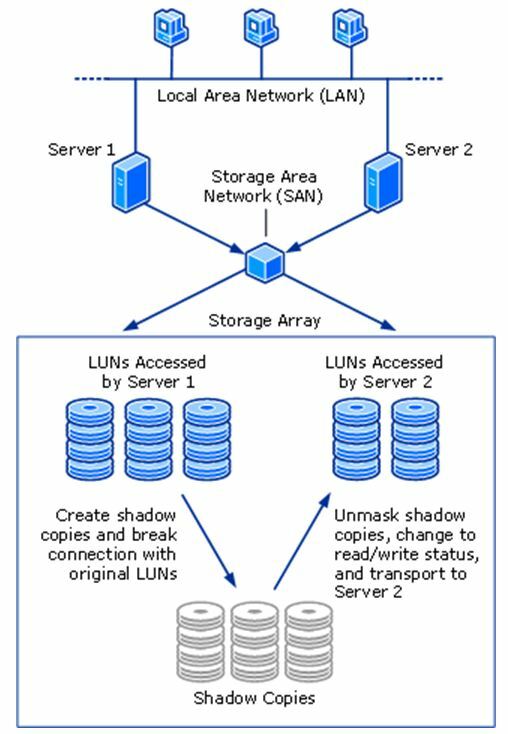 For this reason, the shadow copy LUN must use the same quality of storage as the original production LUN to ensure that performance is not impacted after the recovery operation. If LUN resynchronization is used instead, the hardware provider can maintain the shadow copy on storage that is less expensive than production-quality storage. If the destination LUN is unusable and needs to be recreated, LUN swapping may be more economical because it doesn't require a destination LUN. All of the operations listed are LUN-level operations. If you attempt to recover a specific volume by using LUN resynchronization, you are unwittingly going to revert all the other volumes that are sharing the LUN. Shadow Copies for Shared Folders uses the Volume Shadow Copy Service to provide point-in-time copies of files that are located on a shared network resource, such as a file server. With Shadow Copies for Shared Folders, users can quickly recover deleted or changed files that are stored on the network. Because they can do so without administrator assistance, Shadow Copies for Shared Folders can increase productivity and reduce administrative costs. For more information about Shadow Copies for Shared Folders, see Shadow Copies for Shared Folders (http://go.microsoft.com/fwlink/?LinkId=180898) on TechNet. With a hardware provider that is designed for use with the Volume Shadow Copy Service, you can create transportable shadow copies that can be imported onto servers within the same subsystem (for example, a SAN). These shadow copies can be used to seed a production or test installation with read-only data for data mining. With the Volume Shadow Copy Service and a storage array with a hardware provider that is designed for use with the Volume Shadow Copy Service, it is possible to create a shadow copy of the source data volume on one server, and then import the shadow copy onto another server (or back to the same server). This process is accomplished in a few minutes, regardless of the size of the data. The transport process is accomplished through a series of steps that use a shadow copy requester (a storage-management application) that supports transportable shadow copies. Create a transportable shadow copy of the source data on a server. Import the shadow copy to a server that is connected to the SAN (you can import to a different server or the same server). The data is now ready to be used. A transportable shadow copy that is created on Windows Server 2003 cannot be imported onto a server that is running Windows Server 2008 or Windows Server 2008 R2. A transportable shadow copy that was created on Windows Server 2008 or Windows Server 2008 R2 cannot be imported onto a server that is running Windows Server 2003. However, a shadow copy that is created on Windows Server 2008 can be imported onto a server that is running Windows Server 2008 R2 and vice versa. Shadow copies are read-only. If you want to convert a shadow copy to a read/write LUN, you can use a Virtual Disk Service-based storage-management application (including some requesters) in addition to the Volume Shadow Copy Service. By using this application, you can remove the shadow copy from Volume Shadow Copy Service management and convert it to a read/write LUN. Volume Shadow Copy Service transport is an advanced solution on computers running Windows Server 2003 Enterprise Edition, Windows Server 2003 Datacenter Edition, Windows Server 2008, or Windows Server 2008 R2. It works only if there is a hardware provider on the storage array. Shadow copy transport can be used for a number of purposes, including tape backups, data mining, and testing. This FAQ answers questions about Volume Shadow Copy Service (VSS) for system administrators. For information about VSS application programming interfaces, see Volume Shadow Copy Service (http://go.microsoft.com/fwlink/?LinkId=180899) in the Windows Developer Center Library. When was Volume Shadow Copy Service introduced? On which Windows operating system versions is it available? VSS was introduced in Windows XP. It is available on Windows XP, Windows Server 2003, Windows Vista®, Windows Server 2008, Windows 7, and Windows Server 2008 R2. In the case of a hard disk drive backup, the shadow copy created is also the backup. Data can be copied off the shadow copy for a restore or the shadow copy can be used for a fast recovery scenario—for example, LUN resynchronization or LUN swapping. When data is copied from the shadow copy to tape or other removable media, the content that is stored on the media constitutes the backup. The shadow copy itself can be deleted after the data is copied from it. What is the largest size volume that Volume Shadow Copy Service supports? Volume Shadow Copy Service supports a volume size of up to 64 TB. I made a backup on Windows Server 2008. Can I restore it on Windows Server 2008 R2? It depends on the backup software that you used. Most backup programs support this scenario for data but not for system state backups. Shadow copies that are created on either of these versions of Windows can be used on the other. I made a backup on Windows Server 2003. Can I restore it on Windows Server 2008? It depends on the backup software you used. If you create a shadow copy on Windows Server 2003, you cannot use it on Windows Server 2008. Also, if you create a shadow copy on Windows Server 2008, you cannot restore it on Windows Server 2003. How can I disable VSS? It is possible to disable the Volume Shadow Copy Service by using the Microsoft Management Console. However, you should not do this. Disabling VSS adversely affects any software you use that depends on it, such as System Restore and Windows Server Backup. Can I exclude files from a shadow copy to save space? VSS is designed to create shadow copies of entire volumes. Temporary files, such as paging files, are automatically omitted from shadow copies to save space. To exclude specific files from shadow copies, use the following registry key: FilesNotToSnapshot. It cannot delete files from a shadow copy that was created on a Windows Server by using the Previous Versions feature. It cannot delete files from shadow copies for shared folders. It can delete files from a shadow copy that was created by using the Diskshadow utility, but it cannot delete files from a shadow copy that was created by using the Vssadmin utility. Files are deleted from a shadow copy on a best-effort basis. This means that they are not guaranteed to be deleted. For more information, see Excluding Files from Shadow Copies (http://go.microsoft.com/fwlink/?LinkId=180904) on MSDN. My non-Microsoft backup program failed with a VSS error. What can I do? Check the product support section of the Web site of the company that created the backup program. There may be a product update that you can download and install to fix the problem. If not, contact the company's product support department. System administrators can use the VSS troubleshooting information on the following Microsoft TechNet Library Web site to gather diagnostic information about VSS-related issues. For more information, see Volume Shadow Copy Service (http://go.microsoft.com/fwlink/?LinkId=180905) on TechNet. What is the "diff area"? The shadow copy storage area (or "diff area") is the location where the data for the shadow copy that is created by the system software provider is stored. Where is the diff area located? The diff area can be located on any local volume. However, it must be located on an NTFS volume that has enough space to store it. How is the diff area location determined? If a volume already has an existing shadow copy, that location is used. If there is a preconfigured manual association between the original volume and the shadow copy volume location, then that location is used. If the previous two criteria do not provide a location, the shadow copy service chooses a location based on available free space. If more than one volume is being shadow copied, the shadow copy service creates a list of possible snapshot locations based on the size of free space, in descending order. The number of locations provided is equal to the number of volumes being shadow copied. If the volume being shadow copied is one of the possible locations, then a local association is created. Otherwise an association with the volume with the most available space is created. Can VSS create shadow copies of non-NTFS volumes? Yes. However, persistent shadow copies can be made only for NTFS volumes. In addition, at least one volume mounted on the system must be an NTFS volume. What's the maximum number of shadow copies I can create at one time? The maximum number of shadow copied volumes in a single shadow copy set is 64. Note that this is not the same as the number of shadow copies. What's the maximum number of software shadow copies created by the system provider that I can maintain for a volume? The max number is of software shadow copies for each volume is 512. However, by default you can only maintain 64 shadow copies that are used by the Shadow Copies of Shared Folders feature. To change the limit for the Shadow Copies of Shared Folders feature, use the following registry key: MaxShadowCopies. How can I control the space that is used for shadow copy storage space? Type the vssadmin resize shadowstorage command. For more information, see Vssadmin resize shadowstorage (http://go.microsoft.com/fwlink/?LinkId=180906) on TechNet. Shadow copies for the volume are deleted, beginning with the oldest shadow copy. This tool is intended for use by IT professionals, but developers might also find it useful when testing a VSS writer or VSS provider. DiskShadow is available only on Windows Server operating systems. It is not available on Windows client operating systems. VssAdmin is used to create, delete, and list information about shadow copies. It can also be used to resize the shadow copy storage area ("diff area"). VssAdmin can only be used to administer shadow copies that are created by the system software provider. VssAdmin is available on Windows client and Windows Server operating system versions. This key is used to specify which users have access to shadow copies. This key specifies the maximum number of client-accessible shadow copies that can be stored on each volume of the computer. Client-accessible shadow copies are used by Shadow Copies for Shared Folders. This key specifies the minimum initial size, in MB, of the shadow copy storage area. The following table lists the minimum supported operating system versions for VSS features. This is the ability to import a shadow copy more than once. Only one import operation can be performed at a time.